Michael H. Glantz et al. Once an El Niño event has been forecast, government warnings and news headlines highlight the need for society to get ready for the potential impacts of the event, whether drought, flood, heatwave, disease outbreak, or water shortage. The notion of readiness for a climate-, water- or weather-related hazard or disaster is a fuzzy term, subject to a wide range of conflicting perceptions. Not every government sees El Niño as a direct threat to the wellbeing of its citizens. In this paper, we conceptualize readiness and identify reasons that some governments do not as well as cannot prepare for El Niño’s foreseeable consequences. 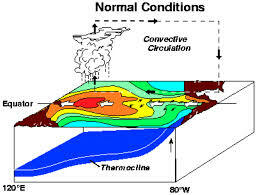 Central among those reasons are its characteristics: quasi-periodicity, event variability, difficulties with onset forecasting, and the fact that El Niño and its “teleconnections” are influenced by numerous other oceanic and atmospheric oscillations. As a result, there is no universally accepted approach to or reliable measure of readiness. The concept is often discussed qualitatively in terms of “shades of readiness”, such as hardly ready, somewhat ready, almost ready, and absolutely ready. Although El Niño is still difficult to forecast, the existing knowledge about it can provide usable information for decision makers to choose whether to pursue strategic or tactical disaster risk reduction policies.